White areas covered with snow and ice reflect sunlight; the effect is called albedo. 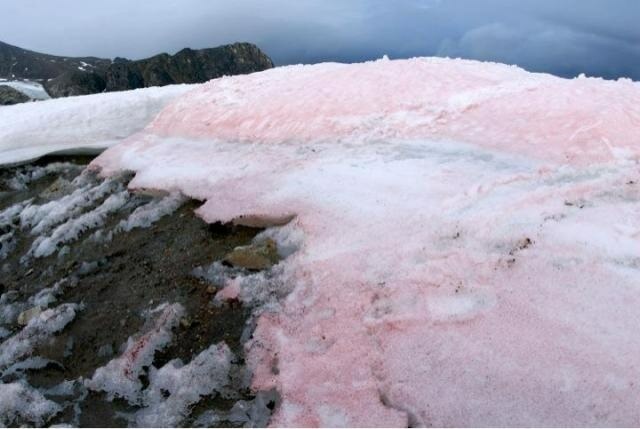 It has been known for quite some time that red pigmented snow algae blooming on icy surfaces darken the surface which in turn leads to less albedo and a higher uptake of heat. The new study by Stefanie Lutz, postdoc at the German Research Centre for Geosciences GFZ and at the University of Leeds, shows a 13 per cent reduction of the albedo over the course of one melting season caused by red-pigmented snow algal blooms. "Our results point out that the "bio-albedo" effect is important and has to be considered in future climate models", says lead author Stefanie Lutz. The red snow phenomenon occurs mainly in warm months. During late spring and summer, thin layers of meltwater form on ice and snow in the Arctic and on mountains. Liquid water and sunlight are crucial for the growth of snow algae; over the winter season they fall into a dormant state. In their study, the team led by Stefanie Lutz and Liane G. Benning investigated the biodiversity of snow algae and other microbial communities using high-throughput genetic sequencing. They took about forty samples from 21 glaciers in the Pan-European Arctic. The sampling sites ranged from Greenland over Iceland and Svalbard to the north of Sweden. Together with UK colleagues they found a high biodiversity within the bacteria, depending on the locations they lived, whereas the biodiversity of the snow algal communities was rather uniform. In other words: Throughout the Arctic regions, it is most probably the same algal species that cause red snow and thus accelerate melting. The blooming leads to a runaway effect: The more glaciers and snow fields thaw the more algae bloom which in turn results in a darkening of the surface which again accelerates melting. Liane G. Benning, head of the GFZ's section „Interface Geochemistry", says: „Our work paves the way for a universal model of algal-albedo interaction and a quantification of additional melting caused by algal blooms." For years, "bio-albedo has been a niche topic", says Daniel Remias, biologist at the Fachhochschule Wels, Austria. The snow algae specialist comments on the study: "For the first time ever, researchers have investigated the large-scale effect of microorganisms on the melting of snow and ice the Arctic." Remias visited the GFZ for an international snow algae meeting organized by Liane G. Benning. He stresses the interdisciplinary approach of the project: "Steffi Lutz' and Liane G. Benning's study for the first time combines microbiological and genetic analyses of red snow algae with geochemical and mineralogical properties as well as with the albedo of their habitat." An international, UK led team, including the GFZ's researchers will work this summer on the Greenland Ice Sheet where currently a record-breaking melting rate due to high temperatures is observed. Steffi Lutz, Liane G. Benning and UK colleagues will investigate whether and to what extent pigmented algae contribute to the record melting.